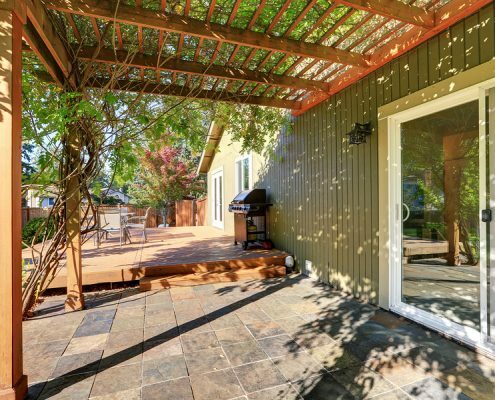 Is your backyard in need of an upgrade, but you’re unsure of your options? For many homeowners like you that want to take your backyard to the next level, a pergola can be just the thing. The Action Home Services team will design a custom Pergola to cover your patio, porch, or really any part of your outdoor space. Pergolas can function as the focal point of your backyard and make any gathering at your place something really special. We value your input and will take the time to listen to your ideas so that we have a clear idea of exactly what you want the pergola to look like and how you intend to use it. Each pergola that we design and build for our clients is specifically tailored to their desires. During this design phase, you will also be able to lean on our significant experience and take advantage of the knowledge we have about what works and what doesn’t. We are experts as we have been doing this for a long time. Our team is made up of only the most qualified design and installation experts and we only use the highest quality of materials. This is why you can trust us to get the job done right, and that your new pergola will continue to look great for many years to come. Gazebos allow you to enjoy your outdoor space in any weather conditions. There is nothing more relaxing than spending time outdoors, knowing that even if it rains you will be able to sit back, read a book and listen to the rainfall. In hot and sunny weather, the shade that a gazebo provides can be a welcome relief. A practical side to having a gazebo is that you don’t need to worry about the elements damaging your furniture to the same degree as if they were left uncovered outside. It is also possible to have a gazebo fitted with screens to keep out bugs. There is a wide range of design options for your gazebo. At Action Home Services, we take the time to make sure that the gazebo we install conforms exactly to your specifications. When we are finished installing your new gazebo, we make sure that you are completely satisfied and happy with the end product. We take care of everything to make sure that getting your new gazebo is a simple and quick process from start to finish. A custom built cabana will allow you to host the best pool parties in town or let you and your family enjoy a quiet day by the pool. They are truly, a multifunctional space that allow you to make the experience of being in your pool very special indeed. We work with only the finest engineers and architects in the businesses to make sure that the cabana that we build is exactly the one you want. We are also sticklers for ensuring that all safety best practices and building codes have been followed to the letter. Having a pergola, gazebo or cabana added to your home will increase the value of your home, as well as providing your family with many years of enjoyment. 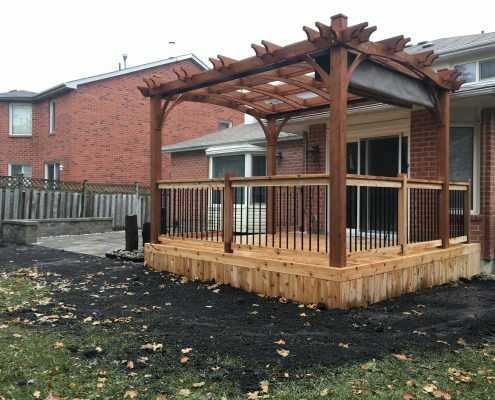 Action Home Services is an experienced and professional pergola, gazebo and cabana contractor serving Toronto, Markham, Vaughan, Scarborough, Brampton, Mississauga, Burlington, Oshawa, Richmond Hill, Milton, Oakville, Aurora, Caledon, Pickering, Whitchurch – Stouffville, Ajax, Whitby, New Market.